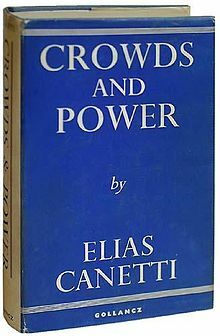 "In Canetti’s system, production is nothing but “the modern frenzy of increase.” Since “increase” is a characteristic of crowds, production becomes just another instance, a double one, of the crowd gone wild, for goods and consumers each make up a crowd." who looted Lord Stanley's fob. the hockey game was a blur. the world watched the fires. A Flash Mob all a Twitter, as the twits turned over cars, burned the Red Carpet, and the portable Shitter. who remembers our hockey heroes upstaged? The Lions host the Grey Cup.